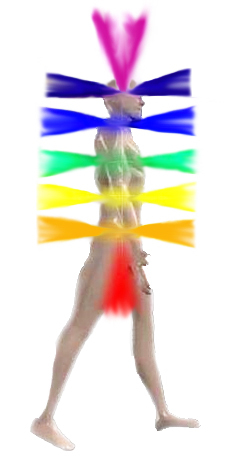 Our chakras are funnel-shaped spinning energy vortexes of multicolored light. 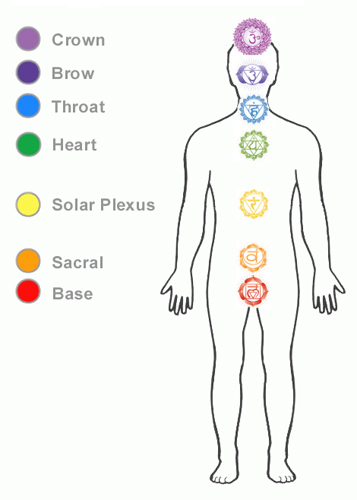 The term “chakra” comes from the Sanskrit word meaning wheel or disc. As the “hot spots” of the energy pathways known as the meridians, chakras are the areas of the highest density of energy and therefore the easiest places to exc hange energy with the outside world. Energy passes through the chakras to your etheric energy field or aura and onto the outside world, and from the outside world back through your auric layers to and through your chakras to your body. This energy exchange is what gives you that psychic sense of your surroundings, while the flow of this energy is directly affected by your thoughts, emotions, health, and state of mind. 1st – Root/Base: Red chakra located at the base of the spine. Its Sanskrit name is muladhara. It is associated with our connection to earth, survival, health, abundance, family, passion, and moving forward in life. If the root (base) chakra becomes unbalanced, you may feel “stuck” and just can’t seem to move forward in life. You may feel ungrounded, with a depleting sense of self. This frequently happens following traumatic events, family problems, death of a loved one, and major life changes. A blockage in the root chakra prevents the release of grief, guilt, and sadness, contributing the the inability to move forward and preventing you from following your destiny. Balancing and opening the root/base chakra allows negative emotions to be released, regenerating confidence and your will to move forward in life. A healthy root/base chakra promotes feelings of security and encourages exploration to find your life’s purpose and achieve success. A balanced root chakra also generates the flow of energy to all other chakras. It is important to wear or carry crystals/gemstones to heal the root chakra and maintain its positive energy flow. 2nd – Sacral: Orange chakra located at the base of the spine. Its Sanskrit name is svadhisthana. It is associated with our connection to other people, creativity, energy, confidence, and sexual health.